Borough Park, NY - 1000’s will gather this weekend to celebrate the 8 ‘yurzeit’ of one of the last Gedolim in America, HaRav Shlomo Halberstam, zt"l the ‘Tazdik’ that rebuild the Hasidic sect ‘Bobov’, and made it again into a dynasty after WWII. He saw a world in its devastation and presided over its renaissance, teaching the new generation the lessons that had sustained the old. “He never forgot where he came from, never accepted the American way,” recalls one of his chasidim. He strove to create a Bobov that would match the Bobov that had been destroyed, working assiduously to build chassidim that his father would have been proud of. He once jokingly commented that “I strive to preserve my father’s minhagim, but I do have one tradition that I haven’t received from my father: my father never owed millions of dollars for his mosdos. Rebbetzin Meislish also described her father’s love for the mitzvah of tzedakah, which saw him give away hundreds of thousands of dollars in charity. He taught her the proper use of money at a young age. Once he took her to the home of a wealthy benefactor. “Ooh, Tatte, what a house,” the little girl whispered admiringly. The Bobver Rabbi miraculously survived the horrors of the Holocaust. He was confronted with death on many occasions, and was prepared to sanctify Hashem’s Name with his own death. He experienced obvious miracles which could fill volumes, teaching how the hand of Hashgocho accompanied him throughout the entire Holocaust, helping him renew the Bobover dynasty after the war. An astounding chapter of his life during the Holocaust focuses on his rescue of Jewish children. In superhuman ways, with enormous mesiras nefesh, he saved Jewish lives, hiding people at the risk of his life. 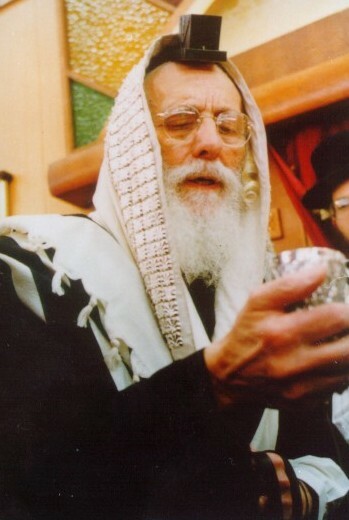 Once the Rebbi was caught along with his son, HaRav Naftoli Zt’l, and was certain that he they would be killed in the morning. He approached his beloved son, and with einayim kedoshos welling with tears, he said: “Naftoli, my dear son, know that the body of a Jew is corporeal—dust from the earth. Man can be killed, but his soul is eternal, and no murderer or evildoer in the world can harm the soul. They prepared themselves for the mitzvah of kiddush Hashem. On the way to the scaffold they were saved at the last moment, and returned to the camp in Bochnia. A Hungarian affidavit in hand, the Admor managed to escape from the camp, and in roundabout ways he reached Kashoi and Budapest. After the Nazi Invasion, he went on to Grosswardein. During the days of wrath he truly drank the bitter cup until its last dregs, losing his wife and two of his children. When he reached Romania he, together with a representative of the Red Armada headed by a Jew disguised as a priest, made valiant efforts to save Jews. They helped save hundreds of children. During the period in which the Bobove’r rabbi was in Bucharest he helped thousands of Jews who had arrived in Romania after the Holocaust: in both ruchniyus and gashmiyus. While he was in Romania he managed to obtain a certificate stating that he was an Italian citizen, and thus received a permit to go to Bari, a city in northern Italy. In the camps in Italy, scores of orphaned children and lone young men who had lost their families clustered around him. He arranged for a G-d-fearing shochet to come from Rome and took care of their material and spiritual needs. He was like a father to them, instilling them with new spirit and drawing them close to him as if he were their father. In time, he traveled to London to participate in the Agudas Yisroel Knessia and from there continued to America. Immediately upon his arrival in the United States he sent visas to his students and sons, and brought them to America. The Bobove’r Rabbi purpose in going to London was to revive the Torah world and the Chassidic Bobov community. The Bobove’r, zt"l, who agreed to fill the place of his father as Admor because his Chassidim begged him to do so, began to lead his flock. Masses of survivors from Bobov began to stream to him, impressed by his sichos, which they felt were comparable to those delivered by his illustrious forbears, the founders and leaders of Bobover Chassidus. Under his leadership, Bobover Chassidus gradually grew and thousands of families numbered themselves among his followers. He established a new generation of avreichim and Torah scholars imbued with exalted spiritual aspirations. He lead his flock with compassion and endless mesiras nefesh, influencing them in ruchniyus and helping them with gashmiyus. 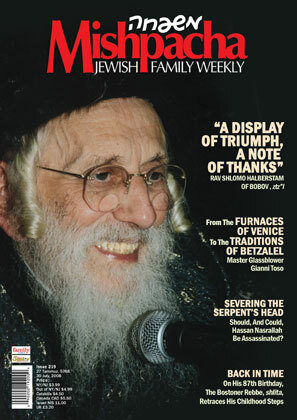 Jews from all sects and circles streamed to Borough Park to his large beis medrash talmid chochom, and his gift of speech and humility, he resolutely succeeded in reviving the spirits of many Jews after the Holocaust, drawing them closer to Hashem. His home in Brooklyn, NY was a beacon where he received everyone with a special glow and with unusual nobility of spirit. His pleasantness had a profound influence on all who visited him and was the source of the tremendous admiration people displayed for him. He was deeply attached to all of the gedolei Yisroel, roshei yeshiva and Admorim, who held him in high esteem. He maintained close contact with them in all the battles for kodshei Yisroel and Torah. The Admor of Bobov, his tradition and legacy, left a deep impression on the entire generation in America. We should all take a moment to think about such a tzadik and internalize, in these trying times, his message of Avdus Hashem. what a beautiful saintly looking hadras ponim! I remeber going to see the Rebbe by simchas beis hashoiava, and other occasions. Seeing the Rebbe dance was to watch a malach of another world dancing, basking in the Glow of the Holy Shechina! I knew the Rov personally, he was like a father to me. I miss him. For how long did the rebbe live on 48 street? I just read the article. A masterpiece.I remmember how close Rav Twersky and Rav Tauber were with him. They got very passige inverviewees. The Bobover Rebbe was truly one of the greatest gedolim of our generation. He is truly missed by all. Just a comment about Mishpacha: It is sad that Mishpacha did not recognize the Yartzeit of the Lubavitcher Rebbe, Z"TL who was the nasi of our generation. Just becasue they didnt do an article on the Lubavitcher Rebbe, that means they missed him? They dont write on every single person! This is exactly the word we do not hear about many today-EHRLICH! The Bobovover Rebbe was not just a tzadik but an EHRLICH YID. may we only hear these wonderful stories that inspire us all. im sensing that you are not such a fan of the Lubavitcher Rebbe Zt"l.
He was not just 'every single person". Der Lubavitcher Rebbe ZT"L had greate admiration for the Bobover Rav ZT"L, and vice versa. I don't mean to disparage anybody, but anonymous 1.pm, what do you mean that The Lubavitcher Rebbe z'l was the nasi of our generation?The title of 'Nosi' has not been around for more than a thousabd years, even the Ramba'm and Rash'i did not retain that title, so how, when and why did the late Lubavitcher Rebbe get such a title? I always thought the word nasi has been used in every generation. In every generation, we had a nasi hador. Rashi and Rambam were leaders of their generation. This is certainly not a place to argue, since the rebbe z"l loved every jew equally. Besides of being a Tzaddik and an EHRLICHER YID we have to point out on the SIMCHAS HACHYIM, By just looking on his HEILIGER TZIRAH you just lit up. How would Boro Park look today if not for this Holy Angile????? It is the Bobover Rebbe who turned BP into a EIR V'AIM BYisroel.